Fencing, as Wikipedia relates, is a modern sport, only one of four sports to have been part of everyone of the modern Olympic Games. The sport developed from the training given to soldiers in historical times to improve their martial skills. Because modern fencers are very safety concious use kit made to very high safety standards and we use non-lethal weapons we get to perfect our skills to a much higher level that would be possible in the past. These days one mistake isn’t you last! You might lose a bout but only your ego suffers not your physical well being and you do get to have another go with the benefit of hindsight! 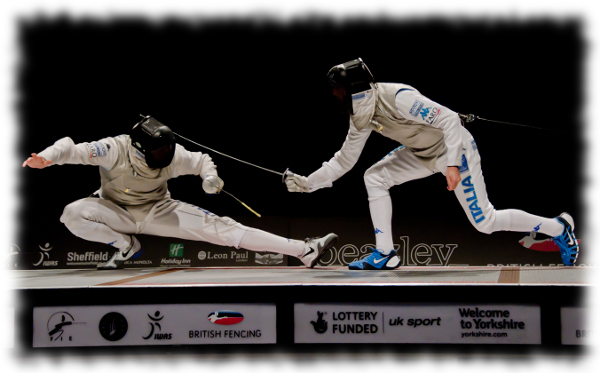 Fencing has three disciplines (Foil, Epee and Sabre) all of which can be fenced using either plastic or metal swords. Both genders regularly train together in a community club setting. Competitions for all ages are single gender. However competitions are sometimes merged where numbers are small to increase the experience that will be gained by the fencers. This is usually for younger age groups or beginners categories. Until very recently the only option when starting to fence was to use metal swords with rubber safety ‘buttons on the end and to wear fully safety clothing to keep yourself safe during the training sessions. The getting ready and putting away the gear at the end of sessions take up time. For a class of children this takes about 15 to 20 minutes per session. Good plastic swords were introduced in the last few years by several suppliers. To my mind they are a fantastic development for the sport of fencing. Initial training using any of these weapons systems provides realistic training in which the skills developed can readily be transferred over to ‘metal’ fencing at a later date. The beauty of using this kit is that it allow a coach to deliver sessions that would have been impossible in the past due to either time, excessive summer heat, kit availability or financial constraints. With plastic swords the amount of safety equipment that needs to be worn is minimal reducing the time needed to ‘kit up/down’, reducing the insulating effect and preventing over heating, the cost of kit is much less than that of conventional kit meaning more kit can be purchases for a given pot of funds and it weighs less so is easier to move from venue to venue. All these benefits go hand in hand with providing meaningful training to the fencers that transfers over to metal sword fencing with only very little change. Once a mask and plastic sword has been issued training can commence in moments after a short safety briefing. Any breaches in the Midi-Fence plastic sword fencing safety protocol have far less serious ramifications than if metal swords had been involved. Sessions as short as 30 minutes have become a possibility. Using metal swords is the nearest thing you will get to duels of the past. To ensure safety more equipment has to be worn. As well as a metal mask you need to be wearing a jacket, a plastron (half jacket) and a glove as well as long trousers. Female fencers need to wear additional chest protection. A detailed safety briefing is also required before training can commence. Fencers are responsible for their own safety, that of their training partner/opponent, the other fencers and officials in the room and that of anyone else entering the room unexpectedly. Safety is the thing that is foremost in all fencers minds. ’Safety is no accident’, is taught by coaches but is everyone’s responsibility. Taking is responsibility on-board is essential and failure to do so is against the spirit of the sport. Most clubs have codes of conduct which will censure unacceptable behaviour and may lead to expulsion from a club if not rectified. Which ever system, metal or plastic is used for the initial and continuation training most fencers start using the Foil to gain basic skills then progress onto the other weapons if they so choose and the coaching resource / expertise is available at the venue.